GOLA is a performance which utilizes the form, rhythm, and dogma of national ceremonies. To a large extent, national ceremonies function as a public theater to transmit notions of collectivity, grief, victory, and above all, pride in the nation. GOLA plays on the misuse of these ideologies to provoke a certain visceral reaction. 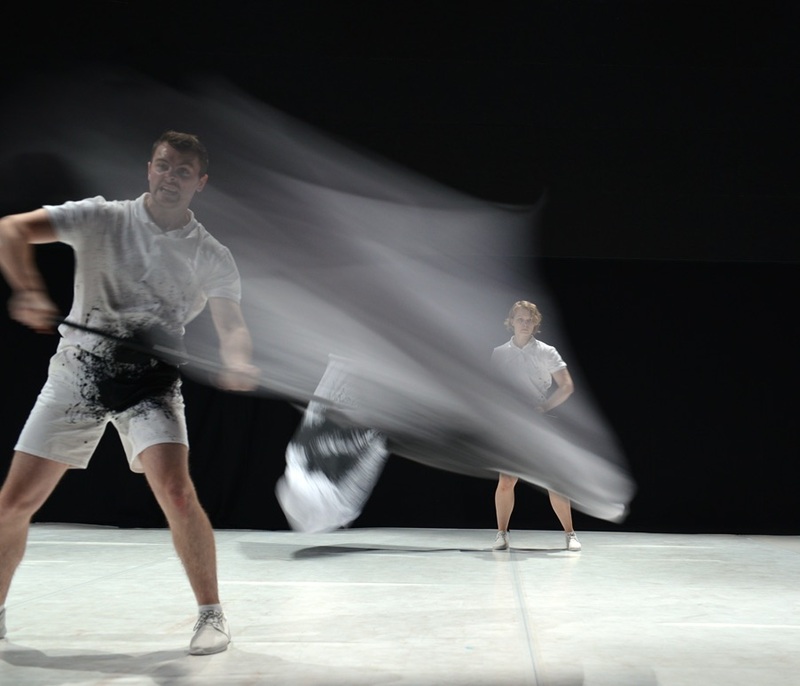 Throughout the work, recurring elements and movements from national ceremonies, such as flag-waving, marching, standing formations, speeches and a hymn, are adapted into a modular, performative language. These elements, which are largely synchronized, emphasize the meticulous and exhausting nature of collective action. The performers stomp, shuffle, jump, and march, compulsively repeating these movements until they produce a thundering and deafening sound. Endurance becomes a standard which is decided by the group; the performers push themselves until they can no longer. Who drops first is the ‘weak one’, while the more powerful is carries the other. Energy levels and performative displays vacillate between strength and unregulated aggression, and weakness and despair . GOLA is a metaphor for the individual who is unable to cope with certain levels of power dictated by the collective, and in society writ large. 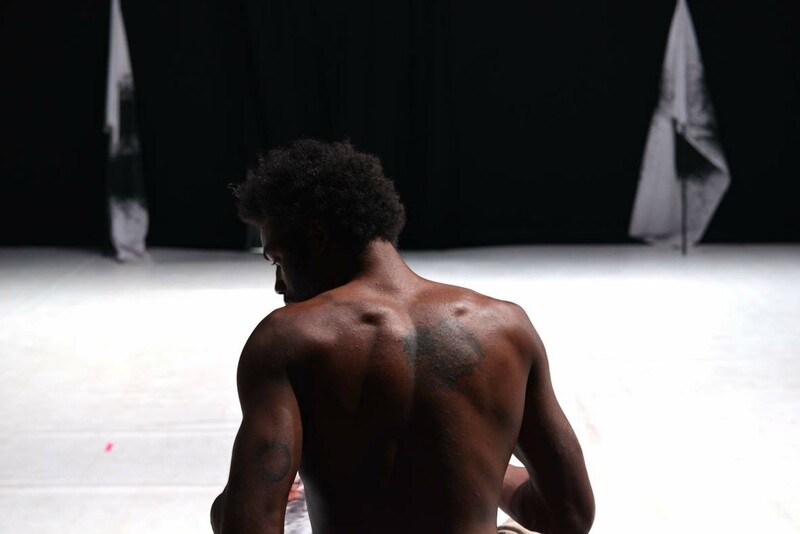 The piece is inspired by the personal experience of the choreographer, re-located from Israel to Germany, living in the diaspora (GOLA) and so to say, left behind. 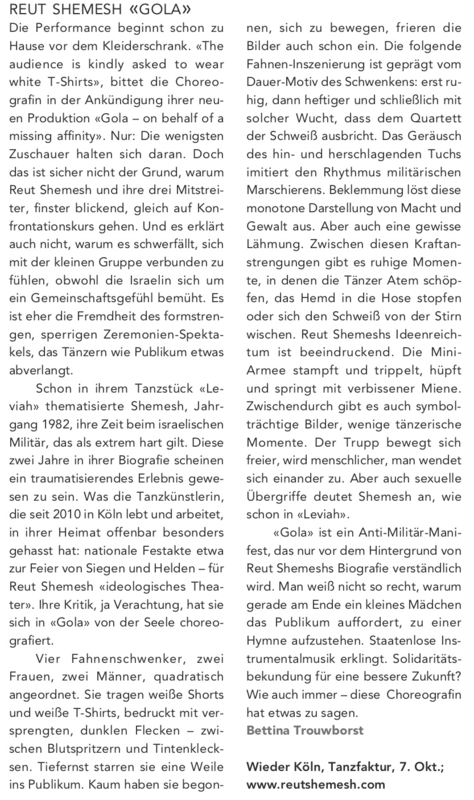 Made possible by GOLA is a production of Reut Shemesh Company coproduced by ASPHALT Festival Düsseldorf. Made possible by the City of Cologne | cultural department, Ministry for Family, Children, Youth, Culture, and Sport of the State of North Rhine-Westphalia, RheinEnergieStiftung Culture. Supported by TanzFaktur Köln, Ehrenfeld Studios, and iDAS NRW.